Way too many upgrades to mention please text or email for information on complete build from stock to BADASS!! 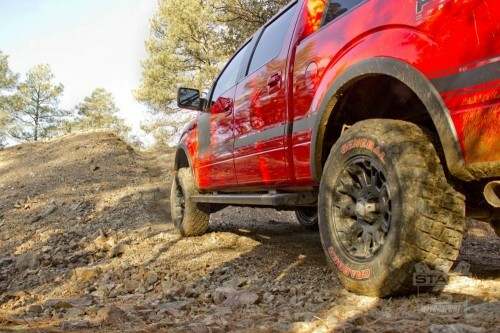 Parts Installed:: 2009-2014 F150 4WD ICON Stage 2 Suspension System, 2004-2014 F150 4WD ReadyLift 3″ Rear Lift Block, 2004-2014 F150 18×9″ KMC XD Misfit Matte Black Wheels, and 275/70/R18 General Grabber Tires with Red Lettering, FX4 Appearance Package Decal, FX4 Appearance Package Stripe kit with custom lettering. 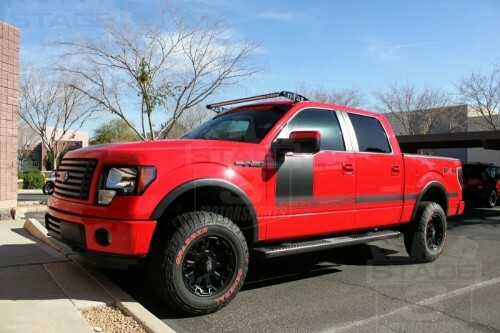 Parts Added: 2011-2014 F150 5.0L aFe Stage 2 Cold Air Intake Kit, 2011-2014 f150 5.0L BBK 85mm Power Plus Throttle Body, 2011-2014 F150 5.0L aFe Mach Force XP Cat-Back Exhaust Kit, 2011-2014 F150 5.0L Solo Performance MR400 Cat-Back Exhaust Kit, and an SCT Livewire Tuner & Dash Monitor with a 5-Star Custom Tune. New numbers are roughly equivalent to 391 horsepower and 399lb-ft of torque at the crankshaft for a total gain of 31 horsepower and 19lb-ft of torque at the crank. Parts Installed: BedRug Bed Liner Kit, Raptor-Style Grille Lights, Recon Smoked Third Brake Light, Rigid Industry D2 Dually Off-Road LED lights, Recon Red Illuminated Side F-150 Emblems. Step Four: Light Bar, Nerf Bars, Backup Lights, and More! 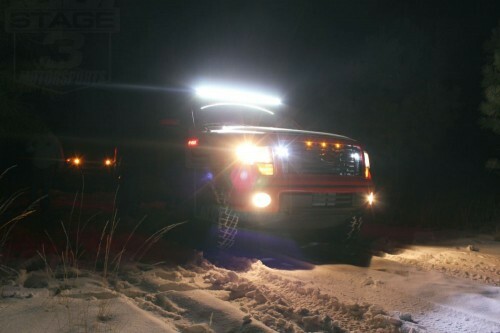 Parts Installed: N-Fab F150 Light Bar Roof Mounts, 50″ Rigid Industries SR-Series LED Light Bar, Starkey Product’s Complete Backup Light Kit, 800 lumen LED puddle lights, 2012 F150 Power Stop Complete Rotors and Pads Kit, N-Fab’s Nerf Bar Steps.